Parks in Los Angeles County need more money to pay for everything from better lighting and equipment to more police and recreational programs, according to a needs assessment report being finalized for county supervisors. The findings, compiled from feedback received from residents during 178 public meetings across the county will be presented to supervisors May 3 to help them determine whether there is an urgent need to place a parks funding proposition on the November ballot. “We’ve all benefited from little and big open spaces,” said Jane Beesley, district director of the Los Angeles County Regional Park and Open Space District at an Earth Day news briefing/environmental justice forum hosted by New America Media. “We need our parks and now our parks need us,” Beesley said. Over the last two decades, funding for county parks was supplemented through Proposition A — a county parks tax approved by voters in 1992 that expired last year. A supplemental levy approved in 1996 is scheduled to expire in June 2019. 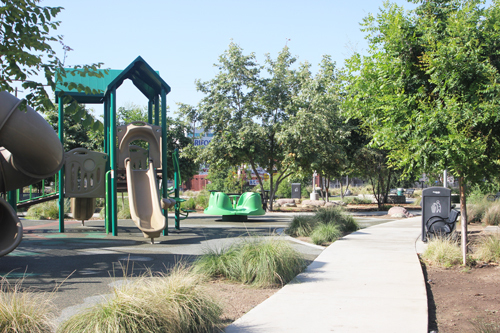 Since 1992, the Regional Park and Open Space District – which administers Prop A revenue – has funded almost 1,500 park-related projects across the county. In addition to ongoing maintenance, the special parcel tax has helped pay for projects like a new Olympic-sized swimming pool at Belvedere Park in East Los Angeles and the restoration of the Griffith Park Observatory and Hollywood Bowl. A similar ballot measure to pay for future maintenance and improvements was narrowly defeated in 2014. Critics at the time said the measure was too vague and lacked community input. Advocates for a new funding measure say those issues have been addressed, citing the hundreds of public parks meetings conducted countywide between December 2015 and February of this year to gather public input in preparation for a possible ballot measure asking voters to pay for park improvements. “We asked them to dream and they did,” said Rita Robinson, project director for the county’s Parks Needs Assessment, noting that more than 5,000 people took part in the workshops. Meetings held in low-income Latino, African-American and Asian-American neighborhoods were packed, environmental groups pointed out during the forum. While no specific details of the report have been released, Robinson said more than 1,700 specific projects were recommended. Activists said many of the proposals were generated in communities of color. Robinson made it clear that the executive summary being presented to supervisors next week would show most county’s parks have high and very high needs. Pamela Marquez is one of those who has witnessed first hand that the “squeaky wheel gets the grease.” For decades, she and other residents of El Sereno demanded that a vacant lot on the outskirts of their predominately Latino eastside Los Angeles neighborhood be converted into a park – but one that fits the needs of the community. “We were given the opportunity to design the park of our dreams and it has made a difference,” Marquez told EGP. The El Sereno Arroyo Playground is now the gem of the community, she said. Park amenities include walking paths, children’s playground, solar lights, security cameras and other features. The park has even increased property values, Marquez added. She said having a park nearby “makes a difference” in one’s quality of life. “My husband lived near a park and joined sports, meanwhile we have friends who joined gangs” because there was no park to offer an alternative, she said, recalling her experience growing up in Boyle Heights. For many residents and environmental activists, parks are a way to engage and build community. Several speakers emphasized the critical role parks play in a community’s health. Belinda V. Faustinos grew up near Lincoln Park and said the park was the only place many parents could afford to take the entire family. She emphasized fixing bathrooms and other amenities that make park-goers feel safe and comfortable. “We need to make sure all parks have that no matter where they are built,” she said. Andrew Yip with Bike SGV said high rates of obesity and diabetes are often found in underrepresented communities that often lack a park or open space. People in these communities often just want the basics, like better lighting and paved streets, he said. 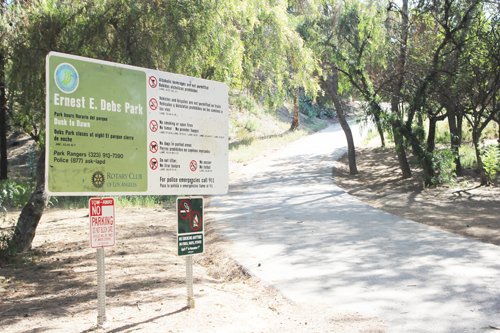 Rosalio Muñoz volunteers at Ernest E. Debs Regional Park in the Northeast Los Angeles neighborhood of Montecito Heights and believes safety measures are needed at the park which includes acres of open space and hiking trails. The bodies of two young women bludgeoned to death were found at the park a few months ago and according to Muñoz the park would benefit from more lighting and a dedicated park ranger and added staff. He worries, however, that a Metro transportation bond on the same ballot might hurt the park proposal’s prospects. “It’s very crowded, but people are committed to parks,” said Beesley. Dozens of public Park Needs Assessment workshops are being held across Los Angeles County’s 88 cities and unincorporated areas to identify parks assets and their needs, but some of those who have already attended meetings wonder if it’s been worth their time since county officials admit there is no funding currently available to turn input into action. 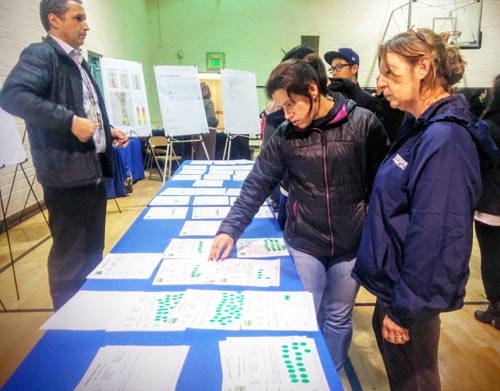 At a Jan. 7 workshop at the Alpine Recreation Center in Chinatown, the city of Los Angeles’ parks and recreation department’s principal supervisor, Frank Herrera, said the meetings are being held to gather input, but explained there’s “not a commitment” from the county to implement any of the recommendations because there is no funding available. “It is an opportunity to let the County know which park projects are more important to the community,” Herrera said. Once all the assessment information has been collected, sometime in May or June, the county will share the information with the cities to use, if they wish, when considering funding allocations for repairs, Herrera said. The Park Needs Assessment will help to determine how to improve, expand, and make parks more accessible, states the project information. Julie de la Torre attended the meeting at the Alpine Recreation Center because she wants repairs made to Yale Park in Chinatown where she takes her two daughters. She told EGP she felt deceived when she realized the workshop was to collect votes on the needs, but not to start working on repairs right away. “We come here with the hope of seeing changes and we leave with nothing,” she said. “Why do they make us vote if there’s no outcome on their side,” she complained, referring to the 10 stickers participants were given to use to vote for repairs or changes they’d like to see at their local parks, such as cleaner restrooms, multipurpose fields, fitness zones, tennis courts, a dog park, etc. Wayland Tam agreed with Wong’s statement saying that for the past 50 years his Chinatown community has been “crying for a pool” but are still waiting. LA County estimates that every year about 70 million people visit the County parks and participate in park-sponsored programs. She explained that the previous Board of Supervisors in 2014 backed passage of Proposition P, a last minute ballot measure to replace funding from Proposition A–the Safe Neighborhood Parks Act–which was expiring in 2015. Prop A funds provided for the “acquisition, restoration and rehabilitation “ of County parks as well as recreation and natural lands. Prop P failed at the ballot box, losing by a 4% margin. Supervisors were told they had failed to “engage with the community” and that not including specific projects in the proposition was a mistake, noted Robinson. Therefore, when Supervisor Hilda Solis joined the board, she asked that the county conduct an assessment to see “What do we have and what do we need” in the parks, said Robinson. Supervisors have invested $3.5 million to cover the costs of consultants, data gathering, outreach meetings, city stipends and other necessary resources to ensure “the most transparent process” for assessing park needs, Robinson added. The 189 study areas include City and County community parks, neighborhood parks, pocket parks and tot lots, recreational facilities including swimming pools, recreation centers, gyms, and skate parks, regional parks and school recreation facilities with joint use agreements. Also, trail corridors along flood control channels and separately owned public trail rights-of-way outside of parks fall into the assessment profile. Cemeteries, golf courses, beaches, plazas and public art installations, however, will not be assessed, according to the project’s website. There’s no timeline in place for securing revenue to implement any of the projects recommendations or findings, however, supervisors are considering a future ballot measure to replace funds lost when Prop A expired. This time, they’ll do it with a plan and a project in hand, said Robinson. “The people’s input helps for crafting the future,” she emphasized. The final report will determine which areas are in most need, prioritizing and outlining costs for potential park projects within each study area, states the project website. A workshop will be held at 7 p.m. today at Lincoln Park, with more east and southeast meeting scheduled throughout January. De la Torre said she hopes city and county officials are not just out creating more false hope. To find more information about the Park Needs Assessment visit, http://lacountyparkneeds.org. Does your family play basketball or soccer? Tennis or swim? Are there enough parks and recreation facilities in your neighborhood? Do they need repairs? Do we need more park facilities or more open space? These are just a few of the questions the Los Angeles Countywide Comprehensive Park & Recreation Needs Assessment study hopes to answer with input from residents in local cities and unincorporated areas. To that end, the county is conducting 200 public meetings to gather information on where park facilities can be improved. The County began its assessment of “189 Study Areas” countywide in March 2015, with meetings continuing through June 2016. During January 2016 alone, more than a dozen meetings will be held in east, northeast and southeast Los Angeles cities and neighborhoods. All will be conducted at area parks and recreation facilities. Why is the County conducting the meetings? Because, according to a County news release, “Parks provide countless health, social, environmental and economic benefits to communities.” Study leaders say adults and children are more likely to increase physical activity and teens are 30% more likely to get recommended exercise if they have access to well-maintained parks. “Physical activity improves general health, prevents obesity and diabetes, reduces the risk of hypertension, reduces the levels of attention deficit in children, improves cognitive ability and reduces aggressive behavior,” according to the County. Therefore, the goal of the extensive, 15 months-long assessment study is to better understand what residents think can be done to “improve, expand and make parks more accessible” to all area of the county. The following are some of the meetings taking place in January. For a complete list of dates, times and locations, call (213) 202-2681 or visit lacountyparkneeds.org. Jan. 14/6pm—South Gate City Hall 8650 California Ave.
Jan. 19/7pm—Bell Community Center 6250 Pine Ave.
Jan. 20/6pm—Pico Rivera Senior Center 9200 Mines Blvd. Jan. 20/6pm—Commerce Senior Center 2555 Commerce Way. Jan. 23/10am—Huntington Park Community Center 6925 Salt Lake Ave.
Jan. 23/10am—Monterey Park Service Clubhouse 400 S. McPherrin Ave.
Jan. 28/5pm—Bell Gardens Veterans Park 6662 Loveland St.
Jan. 28/6:30pm—Montebello Senior Citizen Center 115 S Taylor Ave.